After the gig I did tell Penny and Jennifer that I’d be more than delighted to help promo their gigs later this year. But it wasn’t until October until I spoke with Jennifer Szery. Life is what happens when you’re making other…. black with none, thanks. What was the question? If you didn’t get along to Bemboka in south-eastern NSW, or Corryong in north-eastern Victoria in October, then I’m sure there will be more chances closer to you very soon. Let’s hear more about Salvation Jane from Jennifer, an original member. Bill Quinn: How did Salvation Jane start? 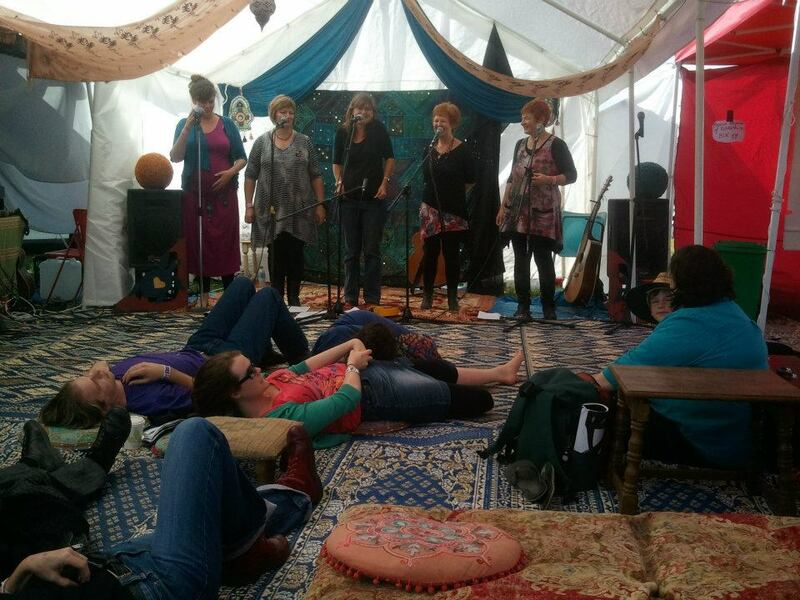 Jennifer Szery: We started back in 1990, and probably our first big performance was Port Fairy [Folk Festival]. We got together because we all went to a bluegrass gathering at Harrietville and it consisted mostly of guys doing their thing. So Rose was very keen to be involved, but there weren’t really many avenues to be involved. So Rose decided then and there to get a vocal group going. BQ: And is that the genesis of the name, that it’s about women? JS: No, it’s actually from a type of honey; it was a jar of honey called ‘Salvation Jane’. BQ: OK! So what did you do in that first incarnation? JS: Port Fairy was a really big thing for us. We did a little cassette and that cassette sold like wildfire when we were at Port Fairy, and that was our launching spot. We then went on to ‘Hey Hey, It’s Saturday‘ (Channel Nine TV) and we won Red Faces. We focussed mostly on a cappella. We had a couple of guitar numbers back then — not many, but a few. When we had a personnel change in 1992 or 1993, we brought in keyboards. And from then until when we broke up in 1996 we had the keyboards, guitar but still one third of our repertoire was based around a cappella. The instruments gave us more genres, really. We’re able to….. well, we’re now doing rap! BQ: So what was the impetus to get back together again? JS: Rose met up with Penny at the National Folk Festival in 2011, and I’ve always kept in touch with Penny. But we’ve been all over the place. I was in Queensland for a long time, Rose is in Mount Beauty (Vic), Tess is in Geelong after being up in northern NSW near Casino, and Anna has always been in Geelong. I moved back here to the coast of New South Wales and at that time I met up with Penny again in person. Penny is so interesting. She’s was at the Western Australian Academy of the Arts (WAAPA) — she’s been in Mamma Mia! and The Boy From Oz. Penny performs with her husband Carl (Panuzzo) and they came to the Candelo Village Festival down here. We met up, and it wasn’t long after that she caught up with Rose, and we thought, why don’t we have a try and see what it sounds like?! A few emails went back and forth and then I drove down to Geelong in July. And the first notes that we sang sounded absolutely right! JS: It was. It was an awesome feeling, that feeling right in the centre of your tummy! BQ: After that first meeting, was the National the first thing afterwards? JS: Yes, we came up to Bemboka — everyone came up here. We decided to really get a repertoire together and a format and a formula. We decided at that point we’d probably aim for four gigs a year given family and work and other things in the way. We’re already up to number eight! We had a house concert here — just neighbours and friends. We all had our laptops here — learning a heap of new songs and brushing up over the old songs. And a friend from Bega videoed us and put three songs on Youtube. Then we decided we were going to record and put out a CD: ‘Something Old, Something New‘. With all of us coming from different areas, we’re keen to launch the CD each in our particular area. The first was last Saturday at Australian Pottery in Bemboka, supported by Train to Budapest [which includes Jenny’s husband, Andrew — and I’d love to add a link, but all Google will give me is timetables from Istanbul!]. And then on Wednesday 3 October at Corryong. We decided that town halls and other halls in small places could do with some more use, so we’re at Corryong on our way home from the CD launch. Rose lives in Mount Beauty, so everyone else will head that way on their way home. We have a three-billing at the Corryong Town Hall: Salvation Jane, Train to Budapest and Mike Martin. BQ: Yes, I love his stuff. JS: Well, he’s our neighbour. His Strelley Project album has been really well-received and we think it’s a really good combination to launch this whole idea. Do give Salvation Jane Reunited a like on Facebook and stay tuned for their further adventures.